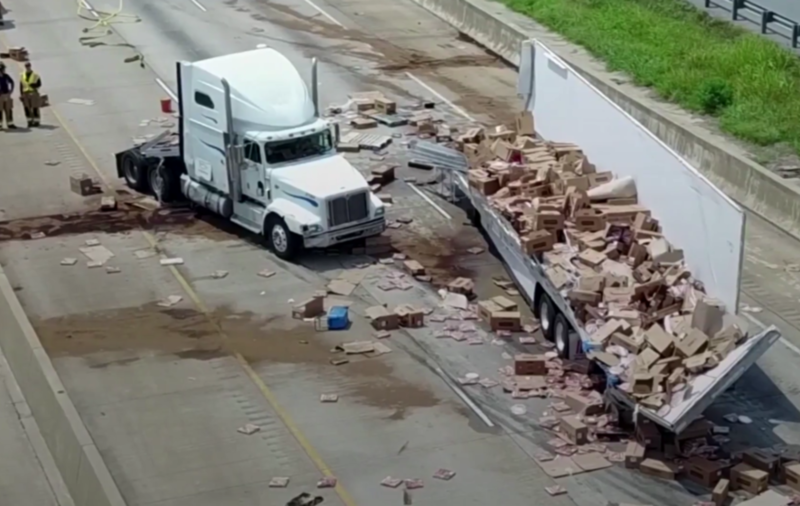 A truck carrying hundreds of frozen ‘Tombstone' pizzas met with its doom on the I-30 near Little Rock. Drivers in Arkansas got an unexpected food delivery on Wednesday, after a truck carrying hundreds of frozen pizzas spilled its cargo onto the road. The lorry reportedly hit an overpass on the Interstate 30, near Little Rock, where it shed its precious load of frozen Tombstone pepperoni pizzas, to the horror of Italian food enthusiasts everywhere. Danny Straessle from the Arkansas Department of Transportation said it had taken all afternoon to make a dent in the massive clean-up operation. “There’s pizza sauce, there’s cheese – you name it, it’s out here all over the interstate,” he said. But if hungry commuters had thoughts of stopping by for a free slice, they were quickly disappointed. Most of the pizzas had been squashed by passing cars and drenched with gasoline and oil. Sorry folks: the pizza party is well and truly over.